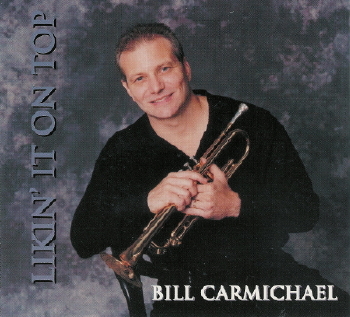 Bill's CD, Likin' It On Top, is a must-have for everybody that loves to hear a lead trumpeter on top of a great 18-piece big band. Bill is absolutely incredible throughout. Of course, it helps to have great arrangements backed by top-talent musicians. 'Likin' It On Top' is the kind of CD that makes a listener wish for more. It has a hard-swinging sound, thanks to arrangements by Ralph Guzzi. The arrangements were written especially for this album. Ralph did an outstanding job on the charts to showcase Bill's talents and feature the excellent soloists. - The entire CD has a deep sense of self and purpose. The Bill Carmichael Big Band has a common feel for excitement and uniqueness.